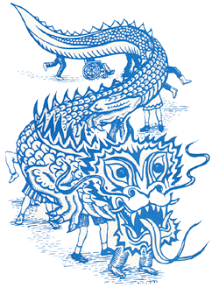 Also known as “Fall Harvest Festival” and “Literacy Night,” this is a great chance to hang out with other parents and staff, take a dance lesson with Coach T, eat free banh mi sandwiches (from the delicious Lan Hue), create some pumpkin art, and find cool ways to inspire your child to read—including a book giveaway! Our fabulous teachers and staff have put together a ton of fun reading-based activities—story time with Mr. Skeffington, word games, music, art projects, and “Reader’s Theater” (perform as your favorite character!). See you this Thursday, 10/26, 5:30 to 7pm! Get there early, the dancing starts at 5:30. Volunteers needed: If you can help set up or clean up, email lowellparents@gmail.com. 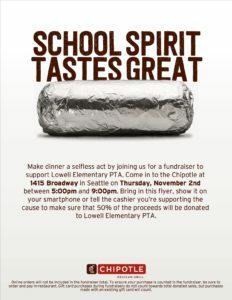 Next Thursday, November 2, from 5pm to 9pm, bring your appetite and show this flier at Chipotle at 1415 Broadway (under Bartells, near QFC at Pike-Pine and Broadway) and 50% of the proceeds will be donated to Lowell PALS PTA. Please share with neighbors and friends! You can also share and/or RSVP on Facebook. Volunteers needed: We need people to hand out fliers in front of Chipotle that night, for 30- to 60- minute shifts—if you can help, please email lowellparents@gmail.com. We’ve had a lot of interest in our school lately, including from fellow PTAs and community members. If you know anybody who wants to help, donate, volunteer, or support Lowell in whatever way they can, you can find more info about Lowell here and anyone can donate or reach out via our FB page. Attendance: If your child is going to miss school for illness, a doctor’s appointment, etc., please don’t forget to let the office know, and they can tell your child’s teacher. You can call 206-252-3020 or email Maria (mdsmith@seattleschools.org). Volunteers needed: The office is still looking for volunteers to cover phones and the front door during much-needed lunch breaks around the middle of the day. Please contact the office if you can help. We’re all in this together! If you need help or have questions, email lowellparents@gmail.com. 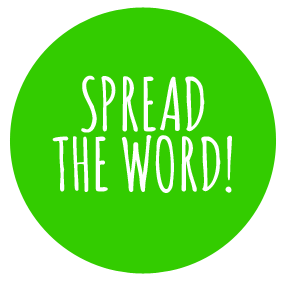 You can also keep up with your Lowell PTA on Facebook (@lowellelementarypals) or at www.lowellelementary.org.